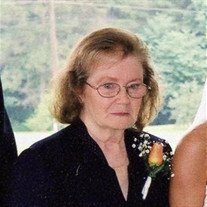 Constance Priscilla Davis, age 82, died early Monday morning, September 3, 2018 at Rhea Medical Center in Dayton. She was born September 18, 1935 in Providence, RI to the late Simon Benson and Catherine (Leffingwell) Benson. Connie was also preceded in death by her husband Dwain Davis, her daughter Susan Davis, her grandson Justin Kaylor and her sisters, Beverly Clements and Dorothy Corfield. Connie lived in Dayton since 1973 and was a homemaker. She is survived by her son Carl Davis of Smyrna; her daughter Nancy Raymond of Dayton; her grandchildren Josh (Amanda) Nixon of Dayton, Rebecca Boyd of Dayton, Jeremy Boyd of Dayton, Brian (Stefanie) Davis of Smyrna, Scott Davis of Smyrna, and Lindsey (Brad Jones) Raymond of Dayton; 11 great-grandchildren; her two brothers Donald Benson of RI and Barret Benson of NH. Funeral services for Connie will be held Thursday afternoon at 5:00 p.m. in the funeral home chapel with Pastor Bobby Scott officiating. She will be laid to rest next to her husband in Rhea Memory Gardens in Dayton. Please share your memories of Connie on her online guest register at www.vanderwallfh.com . The family is being cared for by the Vanderwall Funeral Home in Dayton where they will receive family and friends Thursday from 2:00 p.m. to 5:00 p.m.